Love the fact it comes with 3 different blades and a guard to stop dry ingredients blowing out. I saw a few stand mixers in the past few days but my friend recommended me this one and i love it very much. It comes with different attachments which are really easy to put on. It’s also easy to clean down just remove the bowl and the attachment. The bowl is a good deep size and very easy to clean also. It’s a pretty looking mixer so i just leave it on the side rather than store it. Really good stand mixer, love it. Outstanding value for money, it’s fantastic. Very professionally dealing with a faulty product. Straight away customer support and return. Dial has got loose and product was returned. 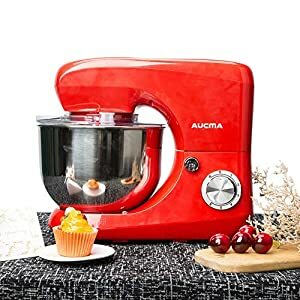 I bought this red mixer for my mom as her birthday gift, she loves it very much and enjoys baking for family with it. 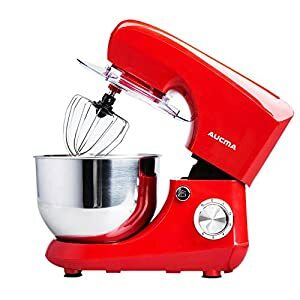 QIHANG-UK Electric Stand Mixer with 5.5L Bowl Beater Whisk Dough Hook Splash GuardColour: Black/RedPower: 800WDimensions: L38.7 X W23.8 X H31.7cmBowl Capacity: 5.5LPackage Content: 1 * Stand Mixer 1 * Instruction Manual 1 * Fit Attachments ( 1 * Beater,1 * Dough Hook, 1 * Whisk)Features:1 x Dough hook Dough hook is the ideal for heavier mixtures. such as bread and short pastry – using the dough hook will take the time and effort out of kneading.1 x Beater For general purpose mixing, beating, folding and combing, this paddle shaped heavy duty die cast beater will gently, but thoroughly combine your ingredients in the most efficient way possible. From cake mixtures, icing and cream to batter, dough and everything in between; this is the attachment that will see the most use for day-to-day mixing.1 x Whisk A large stainless steel balloon whisk is included to make quick work of all light mixing. Whether you’re preparing a delicious cake mixture, a tasty batter, or anything that requires really incorporating air into the mixture; the whisk attachment is the go to tool for the job.5.5L Capacity Bowl Whether you’re mixing material for cupcakes or cakes – the large 5.5L mixing bowl will accommodate your ingredients. – Stand Mixer measures: L38.57 x W23.8 x H31.7cm. Manufacturer 1 Year Warranty. – Generously-sized 5.5L stainless steel mixing bowl is ideal for making bread dough, batters, cake mixes, meringues and more. – Featuring a transparent splash guard with an ingredient chute to keep your worktop and mixing machine clean from any mess and four anti-slip feet to ensure stability during the mixing process.